Julio Villacorta inside his shop. Photo by Noah Arroyo / Mission Local. Yet another business in the Mission District is about to close its doors for good. The cash register at Julio’s Música * Regalos will ring up its final transaction sometime in early March, after the store’s 22-year stint in operation. 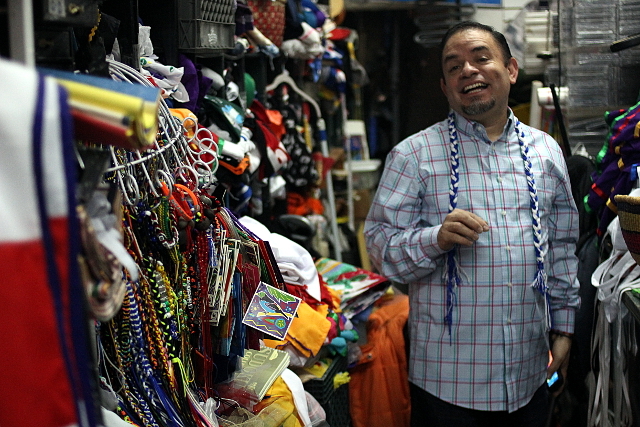 Now, Julio Villacorta, 52, must start boxing up his many T-shirts, accessories, Latin American albums and other wares as he prepares to depart his store at 25th and Mission streets. It will be the end of a career that began when he was six years old, selling thread alongside his mother at a market in San Marcos, El Salvador. Villacorta saw this coming. When people started downloading their albums off the Internet at the turn of this century, it knocked down music stores one by one, eventually reaching those near Julio’s Música * Regalos. Villacorta was sad to see Música Latina Records and Discolandia Records both shut down, but he hoped that he would absorb some of their clientele, he said. That didn’t happen. About five years ago, he might have sold 10 CDs in a single day. “Now, I’ll sell one,” he said. The owners decided to evict Villacorta for not paying his rent. And though Chow said that these factors didn’t affect that decision, he noted that recent roof construction had cost almost $60,000 and the building’s insurance had grown more expensive this year. Today, Villacorta said that he probably still owes eight months’ rent, though he couldn’t say for sure. Chow said that figure sounded right, adding, “The owners can’t survive without rent.” Both men described a series of difficult correspondences with each other. They sounded tired. Villacorta seemed as resigned to his fate as to the neighborhood’s shifting character, which he speculated was tied to his drop in sales. “Things are changing so fast in the Mission,” he said. After years spent converting regular customers into his good friends, he recently noticed that many of them were popping up less frequently. When some of them finally did surface, he learned the explanation. “They all moved out. It was just too expensive,” he said. Today’s Mission District is nothing like the one where he grew into a man. In his late teens, he and his mother had moved to the neighborhood from their home in El Salvador. She worked at a restaurant called Grand Tacos at 16th and Valencia streets, and when he wasn’t in class at Mission High School he was working at Música Latina Records — the job taught him about music and let him practice his English. Now, he said he might earn his living by driving for Uber, and his emotional ties to the community incline him toward volunteering at neighborhood organizations. He’d most like to help at-risk youths at Instituto Familiar de la Raza. “At some point, we all need help,” he said. Sorry to see him go, but you have to keep up with the times if you want to be a business owner. Thankfully he’ll be able to drive Uber though so hopefully the transition isn’t too bad. good luck in your transition.